The PHA defines totally breastfeeding as exclusively receiving breast milk (including expressed) but not receiving formula milk or other liquids. In a bid to increase awareness of the importance of breastfeeding and improve its social acceptability, PHA is due to launch a major breastfeeding public awareness campaign this August. Janet Calvert, PHA’s regional breastfeeding co-ordinator, told Detail Data: “It’s not just about sorting out the health service, although that is a key part of it. It’s creating supportive environments for breastfeeding across communities and within families, and shifting any bias, negative attitudes and misconceptions about breastfeeding. Northern Ireland has the lowest breastfeeding rate in the UK and research by The Lancet also indicates the UK’s breastfeeding rates are among the lowest in the world. “We are living in a bottle feeding culture. Most of us have grown up seeing babies bottle fed,” explained Mrs Calvert. By discharge, the percentage of babies totally breastfeeding had fallen to 37%. The PHA routinely reports breastfeeding figures by adding together the number of babies totally and partially breastfeeding. 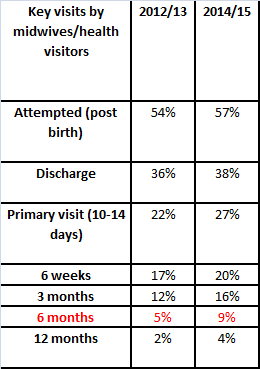 In 2014/15 those figures were 45% at discharge, 13% at six months and 7% at 12 months. However, as WHO recommends exclusive breastfeeding for six months – and the department has adopted that advice – Detail Data focused on those statistics. The World Health Organisation, which directs and co-ordinates international health within the United Nations, is an advocate of breastfeeding. WHO and children’s charity UNICEF recommend babies are fed only breast milk for their first six months. In that context, WHO member states – of which the UK is one - have committed to increase the rate of exclusive breastfeeding in the first six months of life to at least 50% by 2025. According to WHO: “Breast milk is the natural first food for babies, it provides all the energy and nutrients that the infant needs for the first months of life, and it continues to provide up to half or more of a child’s nutritional needs during the second half of the first year, and up to one-third during the second year of life. WHO and UNICEF also established the prestigious UK Baby Friendly Initiative, which works with public services to protect, promote and support breastfeeding. Northern Ireland’s 11 maternity units are Baby Friendly accredited. To enable mothers to establish and sustain exclusive breastfeeding WHO and UNICEF recommend the initiation of breastfeeding within the first hour of life. In Northern Ireland in 2015/16 breastfeeding was attempted post birth with 57% of babies born. Rates across the 11 hospitals ranged from 50% in the Royal Jubilee Maternity to 69% at the South West Acute, both are part of the UK UNICEF Baby Friendly Initiative. Commenting on the figures, the PHA’s Janet Calvert said: “Women stay in hospital on average a much shorter length of time than they did five or six years ago. In many units there’s only really time for one feed, maybe two. The data shows 5,724 babies are born in the Royal Jubilee - which has a neonatal unit for babies born early, with low weight or medical needs - compared to just 1,280 at the South West Acute. A Queen’s University survey of women’s experience of maternity care here in 2016 also found women whose baby was admitted to a neonatal unit were significantly less likely to have skin-to-skin contact (53% vs 91%) or to breastfeed (35% vs 69%) at this time compared to babies not admitted to special units. Our interactive map shows the feeding status at discharge of 24,348 babies born in 2015/16 according to their home postcode. The figures for totally breastfeeding at discharge range from as low as 13% (BT13) to a high of 68% (BT26) depending on the area. BT26 takes in affluent Hillsborough as well as Annahilt and Culcavy while BT13 is home to deprived areas of north and west Belfast including Shankill, Woodvale, Ballygomartin, Springmartin, Glencairn and Highfield. The data further indicates that a mother’s social background has a bearing on breastfeeding with a gradual increase in breastfeeding rates as the level of deprivation decreases. PHA’s breastfeeding co-ordinator Janet Calvert said young mums and those on low incomes were less likely to breastfeed and the agency was trying to address that trend. “Sure Starts have been really pro-active and breastfeeding is a core part of their services. They have trained support family workers in the Baby Friendly Initiative standards and are delivering parenting programs and breastfeeding support groups. That is a really good way of reaching those mums in areas of deprivation. According to a 2014 Northern Ireland Audit Office report – Safer Births – Northern Ireland has the highest caesarean section rate in the UK. In 2012/13 the NI average was 29.8%. Those interventions at birth can present an additional challenge for some mothers when it comes to breastfeeding, according to the PHA’s Janet Calvert. The only hospitals with no babies born in 2012/13 by caesarean section, Downe and Lagan Valley, had the highest breastfeeding rates at discharge, according to PHA data for the same year. Both are midwife-led units and had the lowest number of births. In contrast the hospitals with the highest caesarean section rates - Daisy Hill, Craigavon, Causeway and Royal Jubilee - had lower levels of breastfeeding. Based on the percentage of babies totally breastfeeding at discharge, the Royal Jubilee is ranked out of 11 hospital as 9th, Causeway 8th, Daisy Hill 7th and Craigavon 5th. Mrs Calvert explained: “Caesarean section, induction, vacuum, forceps all those things make it more challenging to get breastfeeding going. According to the Department of Health between 30% and 80% of women are affected by postpartum depression or baby blues, which it describes as a ‘transient mild condition’. However, up to 15% of pregnancies (an estimated 3,750) result in a peri-natal disorder - a diagnosable mental illness. Peri-natal refers to a woman’s mental health during pregnancy and the first year of birth. The department added that there were an estimated 750 cases of moderate-serious disorders per year and around 100 admissions to hospital for severe complex disorders. Lindsay Robinson, Inspire’s Ambassador for Maternal Wellbeing, is one of the mothers in those statistics. Inspire is a mental health charity. Unbeknown to the new mum, she was suffering from ante-natal depression and was later diagnosed with post-natal depression, which she believes impacted on her ability to breastfeed. Lindsay, who runs the website Have you seen that girl? told Detail Data: “I hadn’t had the most straightforward pregnancy. When I look back now I realise I actually had ante-natal depression. Referencing the first time she fed her son formula milk, Lindsay said: “I felt on one hand shame – why could I not do this? Why do I have to give the baby a bottle? And on the other hand maybe it will make it easier - maybe he will be okay on formula. To read Lindsay’s story click here. 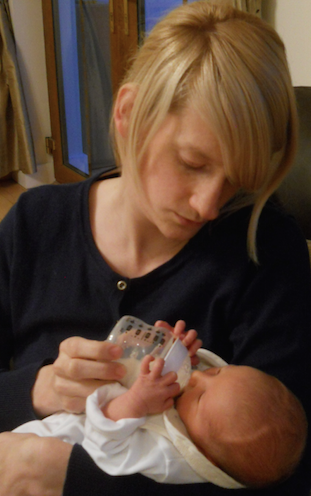 The women had experience of exclusively breastfeeding, combining breastfeeding with bottle feeding and bottle feeding. Issues they had encountered included postpartum depression, mastitis, babies with tongue tie, low birth weight, hip dysplasia, problems getting their babies to latch, milk supply, lack of confidence and doubt. Health visitor Helen Sherry, who works for Larne Parental Support Project, runs the breastfeeding peer support group in conjunction with Action for Children. She explained: “The support group offers them a friendly environment where they can come and breastfeed in comfort. We try to nurture the mothers so they in turn can look after the babies that they are feeding. Read the mums’ stories in full here. In June 2013 the Department of Health published ‘Breastfeeding – a great start: a strategy for Northern Ireland (2013-2023)’ - and tasked the PHA with its implementation. It sets out the strategic direction to protect, promote, support and normalise breastfeeding in Northern Ireland through training, the Breastfeeding Welcome Here scheme, legislation to support breastfeeding in public places, community support programmes and promoting breastfeeding to facilitate change in attitudes/culture. Since the strategy was launched over 38,000 of the more than 72,000 babies born here have left hospital not breastfeeding. The table above shows the decline in breastfeeding from discharge to less than 9% of babies here totally breastfeeding in 2014/15 at the six months stage – the latest full year for which data is available as infants born in March 2016 have just turned one. Janet Calvert continued: “The way you hold a baby for breastfeeding is completely different to bottle feeding and while it’s a natural thing, it’s learned behaviour. There’s a certain instinct on the baby’s part but for most mums they need to be taught that very practical skill. Some manage to learn very quickly and others really struggle. •For more information on breastfeeding, support groups and the Breastfeeding Welcome Here scheme click here.